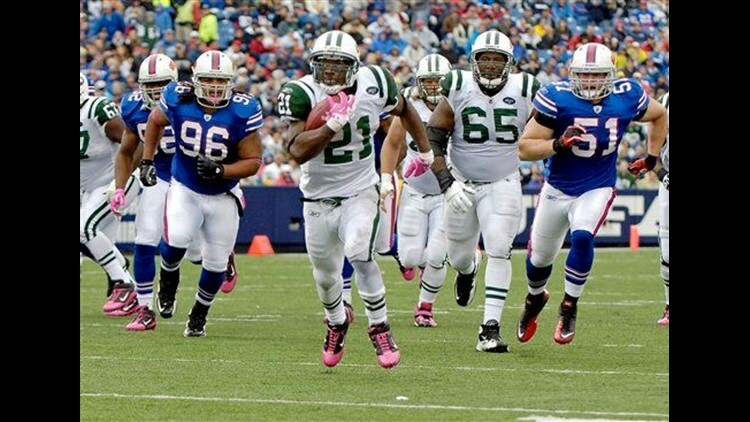 ORCHARD PARK, N.Y. (AP) — LaDainian Tomlinson and the New York Jets had the Buffalo Bills on the run. Tomlinson had the 47th 100-yard game of his 10-year career — and first since he had 105 on Oct. 26, 2008, when he was with San Diego. With 12,831 yards rushing, Tomlinson also passed Tony Dorsett to move into seventh place on the NFL's career list. Tomlinson scored on 26- and 1-yard carries. Sanchez's numbers aside, it was a game in which the Jets needed only a running attack which racked up 273 yards — or 50 more than the Bills entire offense managed. Buffalo's offense lacked spark in Ryan Fitzpatrick's second straight start, and first after the Bills cut former No. 1 quarterback Trent Edwards, who has since signed with Jacksonville. Buffalo's defense continued to struggled against the run, and was hampered further in playing without three starters: end Marcus Stroud (ankle), linebacker Andra Davis (shoulder) and cornerback Terrence McGee (knee). After allowing the Bills to cut their lead to 17-7 in the final minute of the second quarter, the Jets took control in opening the second half by building a 38-7 lead with 2:40 left on Tomlinson's 26-yard run. Keller scored on a 3-yard touchdown from wide receiver Brad Smith, who lined up in the wildcat formation. The Jets then got the ball back after running Marshawn Lynch fumbled after being hit from behind by linebacker Bryan Thomas on the Bills' first play from scrimmage.